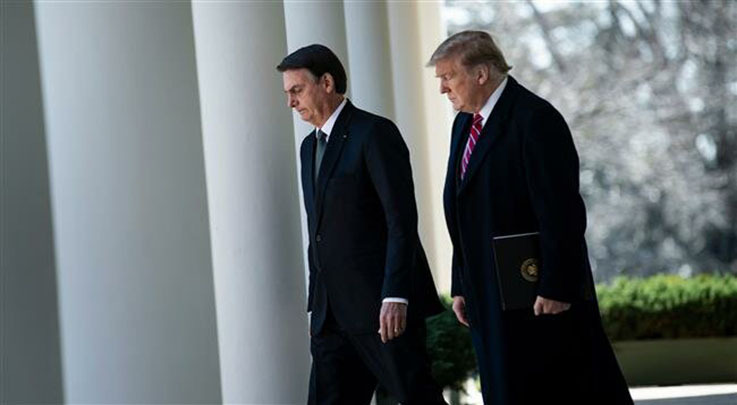 US President Donald Trump said a joint news conference at the White House with Brazilian President Jair Bolsonaro on Tuesday he was strongly considering NATO membership for Brazil as he welcomed Brazilian or some other formal alliance with the Latin American country. “As I told President Bolsonaro, I also intend to designate Brazil as a major non-NATO ally or even possibly, if you start thinking about it, a NATO ally. We have to talk to a lot of people, but maybe a NATO ally, which will greatly advance security and cooperation between our countries,” Trump told reporters, sitting next to Bolsonaro. “We are going to look at that very, very strongly in terms of whether it’s NATO or it’s something having to do with alliance. But we have a great alliance with Brazil, better than we have ever had before,” he added. Trump also stressed that Washington would be looking forward to expanding bilateral ties with Brasilia, saying the US will soon finalize an agreement with Brazil to conduct space launches from the South American Country. Trump recognized the occupied city as Israel’s so-called capital and officially opened the US embassy in the city in May last year, sparking international outrage. The move was later rejected by Brazilian Defense Minister General Fernando Azevedo e Silva.